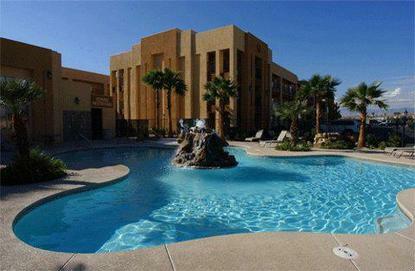 Emerald suites have introduced an exciting new concept in corporate and leisure accommodations to Las Vegas. Our spacious suites are tastefully appointed and designed for your complete comfort. The suites include a living area featuring high-speed Internet access, satellite television with premium channels and a separate bedroom for your comfort and privacy. Each suite is equipped with a whirlpool, kitchen that includes a frost-free refrigerator, dishwasher, microwave, oven and stove. Our properties include a state of the art fitness center, lagoon-style pool and Jacuzzi nestled in the midst of our southwest landscaping. Looking for a quiet getaway? Relocating to Las Vegas?Are you in town on a special project? Emerald Suites truly offers something for everyone?s budgets and desires. Emerald suites offers a great value to the Las Vegas traveler including high-speed Internet access, a full kitchen with dishwasher and microwave and cozy king or double beds in every suite. Other in-room amenities include air conditioning, alarm clock radio, cable TV with premium channels, telephone and voicemail with free local calls and an iron with ironing board. On-site amenities include a lagoon-style pool, fully equipped fitness center, whirlpool, outdoor sundeck and laundry facilities.Located directly on the world famous Las Vegas strip, Emerald Suites is only 4 miles south of the Mandalay Bay resort and 5 miles from McCarran International Airport.